The following article was written for the July edition of ASME Magazine by Frank Wicks, a mechanical engineering professor at Union College in Schenectady, N.Y. He is a cyclist and an ASME Fellow. Enjoy over a cup of tea or coffee. This descendant of the hobby horse put the world in the driver's seat. Since it can’t go as fast as a car or carry as much freight as a truck, a bicycle often doesn’t get the credit it deserves. After all, it is a highly efficient vehicle. A cyclist can travel 12 miles per hour with an effort comparable to walking. The body converts the energy of food into muscle power. You can ride about 1,000 miles at 15 miles per hour using the amount of energy comparable to a gallon of gasoline. Today an estimated billion bicycles are used throughout the world for travel, recreation, and exercise. Perhaps more important, though, are the world-changing engineering achievements that the bicycle made possible. Design improvements during the first 90 years of the bicycle’s history provided much of the initial technology that was extended to modern motorized forms of transportation. It was no accident, for instance, that Henry Ford called his first internal combustion powered vehicle a quadricycle. To keep its weight down, it ran on bicycle wheels. In a very real sense, the bicycle was the ancestor of the Model T, and we all know where that led. The Wright brothers and Glenn Curtiss used bicycle shops as bases for pursuing their pioneering work in human flight. William Harley built bicycles before teaming up with Arthur Davidson to make motorcycles. Paul MacCready and others have used bicycle-type drive systems to achieve human-powered flight. The first steerable two-wheel vehicle was an attempt to create a mode of transportation during a period of worldwide disaster. The invention is usually attributed to German inventor Karl Drais, who introduced it in 1817. The incentive has been traced to a massive volcanic eruption of Mount Tambora in 1815. The solar reflectivity of the ash in the atmosphere caused drastic global cooling. The year 1816 has been called “The Year Without a Summer.” Crops failed. Starving horses were slaughtered for food. A new form of transportation was needed. The Drais machine, made mostly of wood, was called a hobby horse, dandy horse, or draisine. Propulsion was by walking or running while the rider sat on the frame, not far different from the Flintstones’ family car. As people used the hobby horse, though, they discovered that it could remain upright while moving forward even with both of the rider’s feet off the ground. This was a surprising and important discovery that demonstrated the potential of alternative propulsion with the feet not touching the ground, an innovation implemented in 1840 by Kirkpatrick Macmillan in Scotland. He developed a back-wheel drive using connecting rods and treadle pedals. Wheel design was one of the key enabling technologies for bicycles. Spoke wheels go back to antiquity, and for most of history, they were made of wood and operated in compression, with the bottom spokes taking the load. Eugene Meyer of France invented the adjustable tension wire spoke in 1866. The load is taken by the upper spokes while all of the spokes work to retain the circular shape of the rim. It can be noted that wooden spokes in compression support the load like an arch bridge, while wire tension spokes support the bicycle and rider like a suspension bridge. Wire spokes significantly reduced the weight of the wheel. In 1877 an American Civil War veteran known as Colonel Albert Pope started making high wheelers under the brand name Columbia in a sewing machine factory. The bicycles cost $125 while sewing machines sold for $13, so the change promised greater profit on each sale. But the bicycle in the 1870s was not for everyone. Cycling continued to be an activity for the rare individuals who had skill and patience. It was a challenge to mount and dismount as well as to ride and stop. It was not until 1885 that John Starley in England introduced the “safety bicycle,” which virtually anyone could learn to ride with relative ease and safety. It allowed the rider to start and stop with both feet on the ground. It used two wheels of the same size. The back wheel was powered by chain and sprocket. The big sprocket on the pedal crank and smaller sprocket on the back allowed the wheel to turn faster than the rider pedaled. It also allowed the cyclist to pedal at the rate at which he could produce the most power. The safety bicycle was the result of several new enabling technologies. These included better materials and fabrication methods, low-friction ball bearings, chains with bushings that rolled easier over the sprocket teeth, pneumatic tires for better traction and comfort, and hollow tubing made of stronger steel. The safety bicycle was disruptive technology. It created a new idea in transportation-the personal vehicle. It did not require the cost and complications of maintaining and harnessing a horse. A rider could travel from place to place without conforming to the schedule of public transportation. It was a dramatic new form of freedom. Susan B. Anthony proclaimed that bicycling had done more to emancipate women than anything else. The bicycle became a symbol of the closing decade of the 19th century, called the Gay ’90s. It was the first Golden Age of the Bicycle. The Wheelmen, an organization dedicated to keeping the heritage of early cycling alive, has identified more than 3,000 brands of bicycles that were made between 1890 and 1918. Even so, ownership continued to be limited to the relatively affluent. 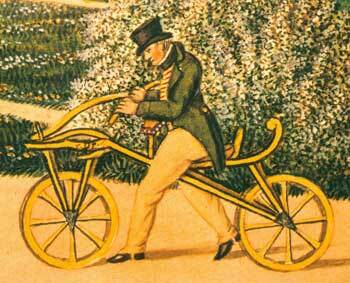 But more important than the bicycle’s effect on the close of the 19th century was its influence on the 20th. The techniques and technology refined for the bicycle enabled the developments that reshaped the world. 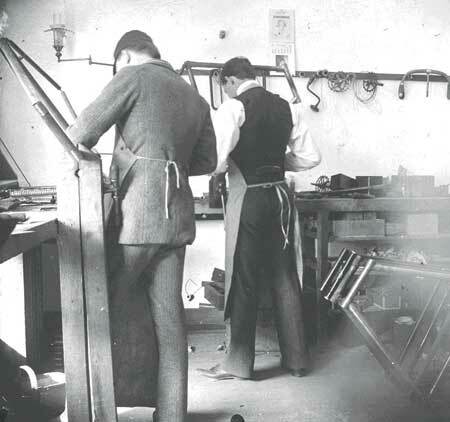 The brothers Wilbur and Orville Wright in Dayton, Ohio, had built a printing press in 1889, and had started a newspaper, but it was losing money. In 1892 Orville paid $160 for a new Columbia safety bicycle and Wilbur bought a used one for $80. They soon opened a business to sell bicycles and parts, and to perform repairs. In 1896 they introduced their own bicycles, hand-made for each customer. Options included the type of handlebars, metal or wooden rims, and single or double tube tires. They invented a self lubricating hub that protected the bearings on dirt roads. This was also the year the German glider pioneer Otto Lilienthal died when his bird-like flying machine stalled in flight. This tragedy inspired the Wrights to pursue their own aviation experiments. They would become the first to achieve controllable and powered flight just seven years later. An observer noted that the Wright Flyer looked more like a bicycle than like a bird. 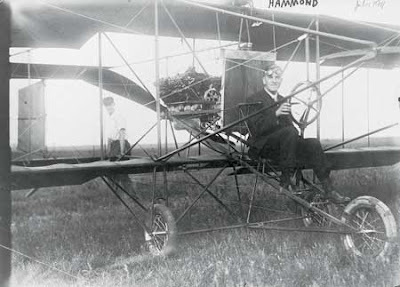 The remark was appropriate because the bicycle was a vital link to the first successful airplane in several ways. Experimenting with flying machines required time and money. The Wrights’ bicycle business made a good profit of $3,000 in 1897. The business was also seasonal, which gave them free time in the fall and winter. They used a bicycle to compare and measure the lift and drag forces of different wing shapes, and from this information they also designed remarkably efficient propellers. Piloting required developing a new set of skills. The Wrights studied the similarities between steering a bicycle and controlling a flying machine. Each requires the ability to bank for coordinated turns. Controlling the bank angle on a bicycle requires a steerable front wheel. After encountering stability problems with their first gliders, the brothers achieved controllable flight by introducing a vertical rudder. The Wrights had also hired an excellent craftsman and machinist named Charlie Taylor to help in their bicycle shop, who was crucial for their success in powered flight. Taylor was able to follow rough drawings and build the brothers a four-cylinder gasoline-fueled engine with an aluminum crankcase. The Wrights use of bicycle type chains and sprockets was also vital. It allowed for two propellers to be driven by a single engine with the best ratio between engine and propeller speed. This ability to match the best engine and propeller speeds enabled a 700-pound flying machine to get off the ground with only 14 hp. Glenn Curtiss also started with bicycles before becoming a fierce rival of the Wrights in aviation. Curtiss was 15 years old and working for Eastman Kodak in 1893 when he bought a bicycle for $125. He raced through the streets of Rochester and the rolling hills of his birth village of Hammondsport 70 miles to the south. He competed on race tracks in New York and other cities. Curtiss next expanded from bicycles to engines and motorcycles. He installed a V-8 engine on a motorcycle in 1907 and traveled at 136 mph on a one-mile course. He became known as the Fastest Man on Earth. The relatively light and powerful Curtiss motorcycle engines provided his entry to aviation. Calling on the experience he had gained from bicycles, engines, and motorcycles, he soon showed a talent for designing flying machines. Curtiss used his cycle shops to build a skid-mounted aircraft that he flew off a frozen lake in the winter of 1908. He used bicycle wheels on his next machine, which he flew for a Fourth of July celebration in Hammonds-port. He was awarded a Scientific American prize for the first observed flight of one kilometer. It is noted that the Wrights had already flown much longer distances, but their flights were not recognized for lack of witnesses. The next year Curtiss traveled to France and set an air speed record of 47 mph around a triangular course. He later explained how his bicycle experience translated into air racing. He retained full power through the turns by climbing to slow while entering a turn and then diving to recover speed while entering the straightaway. This is an energy conservation technique. Kinetic energy is converted to potential and then back to kinetic. It is a technique that Curtiss had mastered while racing bicycles on banked tracks. By 1910 the excitement and new freedom of the bicycle was being replaced by the automobile. It was led by the mass-produced and affordable Model T introduced by Henry Ford. Motorcycles and airplanes provided excitement for the more venturesome. The high energy density of gasoline combined with the light and powerful spark-ignition internal combustion engine was quite literally driving a transformation of entire societies and economies. The introduction of electric power for factories, standardization, and mass production decreased the price of a bicycle. In the United States a bicycle became mostly a child’s toy that would be abandoned once one was old enough to drive a car. Adults in Europe continued to rely upon bicycles for transportation and recreation. Bicycle use was promoted in China, which now leads the world in the number of cyclists. With a few exceptions, such as wider tires and an optional three-speed gear in the hub, there were few changes in the appearance of bicycles for half a century. The revival of the bicycle in the United States started in the early 1970s. Cultural changes, physical fitness programs, the oil embargo, recognition that fossil fuels are limited, the advent of Earth Day, new environmental agencies, and bicycle paths and lanes all came together to revive the bicycle as a vehicle for adults. The racing bicycle with 10 speeds achieved by multiple sprockets and a derailleur for shifting came to market around 1970. A decade later the mountain bicycle with front and back spring suspensions was introduced. Improved machining and shifting precision has allowed options for 15, 18, 21, or 24 speed ratios. New bicycle features are often old ideas that become realities because of better materials, new capabilities, and increasing numbers of passionate cyclists. Options in production or under development include electric solenoid-assisted shifting that is controlled by the rider, automatic shifting that is controlled by computer, and various types of continually variable transmissions. Another feature is a computer-controlled suspension that is adjusted according to the conditions of the road or terrain. It is generally expected that the fossil fuels that have powered our vehicles for the 20th century will be mostly depleted over the 21st. The alternatives such as biomass and hydrogen will be much more expensive and limited. Electric vehicles have the potential to be powered by hydro, wind, or solar energy. However, demand will probably exceed the capability to sustain increasing fleets of large, high-speed vehicles. Thus, the best hope of sustaining personal transportation for future generations may be with electric vehicles that are much lighter and slower. While they are still rare in the United States, there are now an estimated 120 million electric bicycles in China, and the numbers of these vehicles is rapidly increasing in India and European countries. The most common hybrid vehicle of the future may not be the now familiar four-wheel automobile combining an internal combustion engine and electric motor, but the electric bicycle that can be powered either by a rider’s muscles or energy stored in a battery. A development like that would be almost full circle. The only difference between that future and the first safety bicycle would be that electric power was harnessed along the way. While modern cyclists know by experience that a moving bicycle will stay upright, the explanations remain complicated and controversial. Mechanical engineering professor David Gordon Wilson of the Massachusetts Institute of Technology provides some insights in his classic book Bicycling Science. According to Wilson, the rider keeps upright by continually making small steering corrections with the front wheel. Design parameters like the fork angle and the trail, which is the distance between the point where the fork axis is pointed at the road and the point of tire contact with the road, contribute to stability. Experimenters have been mostly unsuccessful in attempts to build a bicycle that cannot be ridden. Most riders, however, are incapable of balancing a bicycle rolling backwards. A rider and a bicycle are a remarkably well matched system that has inspired many forms of competition requiring endurance, speed, and athletic skill. The most famous endurance event is probably the Tour de France. It is now a 21-day and 2,200-mile event that encircles France and includes stages in neighboring countries. It was conceived in 1903 to sell newspapers. Cyclists are professionals who compete in teams backed by sponsors that have included banks, telephone companies, the French national lottery, and the United States Postal Service. The event has been dominated by European riders with the exception of Americans Greg LeMond and Lance Armstrong. BMX, which stands for Bicycle Motor Cross, can be traced to California youths, who invented it as an exciting pastime in the late 1960s. It too has made the big time. Youngsters started to use bicycles to imitate the popular MotoCross motorcycle competitions that were performed off the road and across open country. The terrain required sharp turns, jumps, and other maneuvers to avoid obstacles, and the young bicycle riders copied those moves. A specialized BMX bicycle was eventually developed for the challenges. The popularity of BMX cycling became international, and the sport was introduced as a competition in the 2008 Olympics in Beijing. Obtaining the maximum speed is another challenge. While a bicycle has a very low rolling resistance the irregular shape results in a relatively large aerodynamic drag force that increases with the square of the speed. The best rider can produce about 1,000 watts or 1.34 hp for a short time, which yields a speed of about 40 mph. Achieving 80 mph would require either about eight times more human power, or alternatively a significant reduction in aerodynamic drag. The reduced drag solution was demonstrated by Canadian bicycle racer and designer Sam Whittingham. In 2009 he achieved a speed of 82 mph over 200 meters with a running start while enclosed in a bullet shaped module racer and recumbent position to further decrease frontal area. Streamlining and drag reduction are concepts pursued by student teams in an annual ASME competition, the Human Powered Vehicle Challenge. The year 1903 saw the Wright brothers’ initial powered flight, and the founding of Ford Motor Co. and of Harley-Davidson Motor Co. All the developments had been made possible by the internal combustion engine. Marking the centennial of those events in 2003, Frank Wicks contributed three articles to Mechanical Engineering. "The Remarkable Henry Ford" was published in May 2003 and "Between the Horse and Car," about Harley-Davidson, in July. His article about the Wright Brothers and their early competitors appeared in December 2003 in a special supplement to Mechanical Engineering, "100 Years of Flight". All the articles can be found on Mechanical Engineering Magazine Online, at memagazine.asme.org. David Gordon Wilson’s Bicycling Science, published by MIT Press and now in its third edition, is currently available in a paperback edition.